When I was growing up, members of my church hosted a “progressive dinner” every Christmas. Those who had the most elaborately decorated homes would host portions of the dinner. Appetizers would be at the first home, soup and salad at the next, entrée at the third, ending with a dessert buffet at the fourth home. What I loved most about this event was the platter of desserts we went home with since everyone was entirely too full to eat everything at the final table. The progressive dinner was always a huge success! The past few weeks, we have enjoyed a progressive dinner of sorts as we learned how to read with Adler, how to talk about things we have never read with Bayard and finally, how to think about the things we have or haven’t read with Elder and Paul. These reads have added value to my study habits and conversation by providing a framework for my research and dialogue. This week, the reading reminded me of a book titled Six Thinking Hats. I used this book several years ago to help a project team through a difficult situation. The team was well-rounded in their diversity. Because of this, there were multiple perspectives at the table and even more communication styles. Though I did not have this language at that time, I knew if the team was ever going to settle on a solution to their problem, we would have to think critically rather than egocentrically or socio-centrically. In Six Thinking Hats, Edward de Bono creates a picture of collective problem-solving in terms of wearing different “thinking hats” that allow us to correctly align our thoughts. He describes the problem of thinking like this: “The main difficulty of thinking is confusion. We try to do too much at once. Emotions, information, logic, hope, and creativity all crowd in on us. It is like juggling with too many balls.” In this situation; clear, objective thinking was of utmost importance. Everyone was bringing their own biases to the table, fogging up the way forward. We utilized the concept of thinking hats to separate emotion from logic and imagination from facts. Similar to Elder and Paul, it provided a path forward out of the haze of personal bias and cultural prejudice…a path to critical thinking. Edler and Paul remind me that it is a responsibility of leadership to create environments that help others lay down their self-centered thinking in favor of humble intelligence concerning matters at hand. Perhaps, as leaders, we can provide our own “progressive dinners” that allow everyone to taste different perspectives and collectively discern what is best. Pierre Bayard, How to Talk About Books You Haven’t Read (Amazon Digital Services: Kindle Edition, 2009). Richard Paul Elder and Linda Elder, Miniature Guide to Critical Thinking Concepts & Tools, 7th ed., Thinker’s Guide Library (Amazon Digital Services: Kindle Edition, 2014). 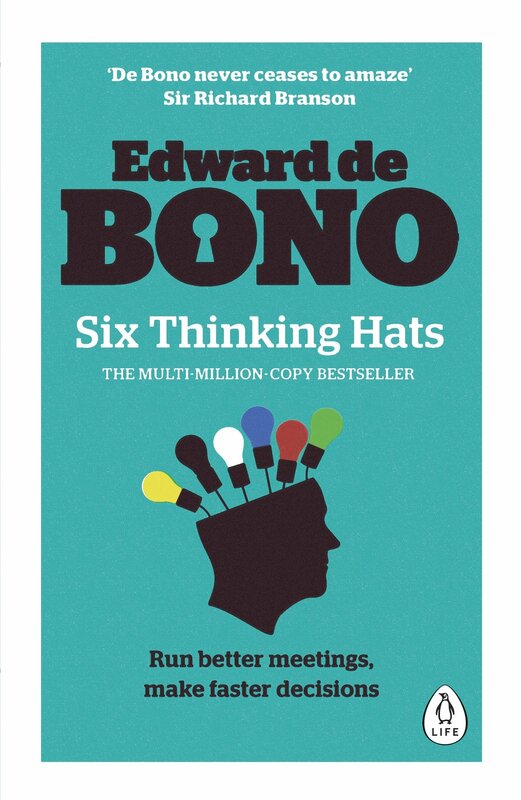 Edward De Bono, Six Thinking Hats, (New York: Back Bay Books), xi. Number one I like eating and need to start one of these progressive dinners ASAP! Number two, thanks for the great insight in this post as it brings to clarity to some issues I’ve encountered in a recent meeting. I will now add another book to my reading list so thanks for that. Keeping in the progressive dinner theme, do you find that at times, you catch yourself staying at the table (wearing a hat ) to long and that causes communication issues, and if so how do you recognize when you’ve eaten too much and need to move on? Great question, Mario. I think we each have a tendency to wear certain hats for too long, depending on the way we are designed, and how comfortable we are with thinking in a particular frame. Perhaps it is our responsibility as leaders or facilitators, to mitigate the fear of seeing from another perspective. It takes courage to keep engaging the conversation when the “hat” is uncomfortable. Critical thinking requires us to let go of our personal preferences and invite others to do the same. Rhonda, you must have been a baby tagging along to those progressive dinners, because we did that a lot in the 80’s. All of the books we have read or as you said, not read, have been a lot to digest for sure. I have packed up some of that reading for later at home because I am certainly full. Thank you for the suggestion of another book to read. I’m going to have to wrap that one up for a later date as well. Weren’t those dinners the best? I completely identify with the lack of time to do all of the reading I would like to do. Keep this one on your list. It is a helpful read. Great post, Rhonda. You and Gary need to get together and compare notes on his study in Conversational Intelligence. He got me reading Judith Glaser and it is extremely helpful in setting up environments for groups to have critical conversations that result in/from critical thinking. Neuro science has become an incredibly helpful tool in understanding the points of conversation that fire the amygdala and what is needed for frontal cortex thinking and productive conversation. That is what spurred my thinking about the heart, mind and speech. Gary’s research sounds fascinating! I do want to sharpen my own critical thinking skills, but I am much more interested in how we encourage collective critical thinking. I continue to search for answers to the question: How do we craft environments that bring others out of egocentric and socio-centric thinking, and invite them to critical conversations…still allowing for the power of the Spirit? Thanks, Harry. I agree that it is always easier to understand concepts through creative illustration. However, I’m not sure what it says about me that I am always eager to illustrate through food. Perhaps we should host a progressive dinner and find out! A couple of years ago our company did a seminar on Fierce Conversations — it’s a book and apparently now a company that does seminars. One of the concepts they put out there is the idea of a beach ball conversation. Each panel on a beach ball is a different color and in the same way each person at the meeting is a panel on the beach ball and has their own side of the story. All sides need to be heard before a decision can be made by the leader of the meeting. Critical thinking feels like a beach ball conversation in your head, except you need to tease out all the sides to get around your own biases. I wonder if that’s similar to the progressive dinner idea that you’re pointing toward.